I actually found the climb of Brokeoff Mtn to be more enjoyable - having done it early on the morning of the same day. Brokeoff Mtn, the Tehama County highpoint, entails a 7 mile round trip with a 2,600 foot elevation gain - slighly more than the 5 miles and 2,000 ft gain of Lassen Peak by the standard route packed with hikers. The Brokeoff Mountain route passes through subalpine forest, streams, and eventually, for the final push, wends its way over barren rock and talus slopes. Nevertheless I was justifiably excited when, starting from the enormous trailhead parking lot, I commenced the final climb for my California completion bid at 11:34 AM on the ninth of July. The switchbacks up the south face of Lassen Pk occur along a barren talus slope devoid of vegetation save for perhaps the lowest few hundred vertical feet. Every time I met a hiker on descent I would say something silly like "its coming!!". Later at the summit somebody commented they thought I was crazy. Of course, how could they know that I was referring to my incipient completion?! The summit area sports two rock formations that compete for the very highest terrain. Both involve class 2-3 travel for some ten or fifteen vertical feet. One is located immediately (i.e. ten feet) north of the obvious weather station. The other possible highpoint is located some fifty feet farther west. Standing upon both and back-sighting, I simply could not tell which was the higher. Climb both to claim the county!! 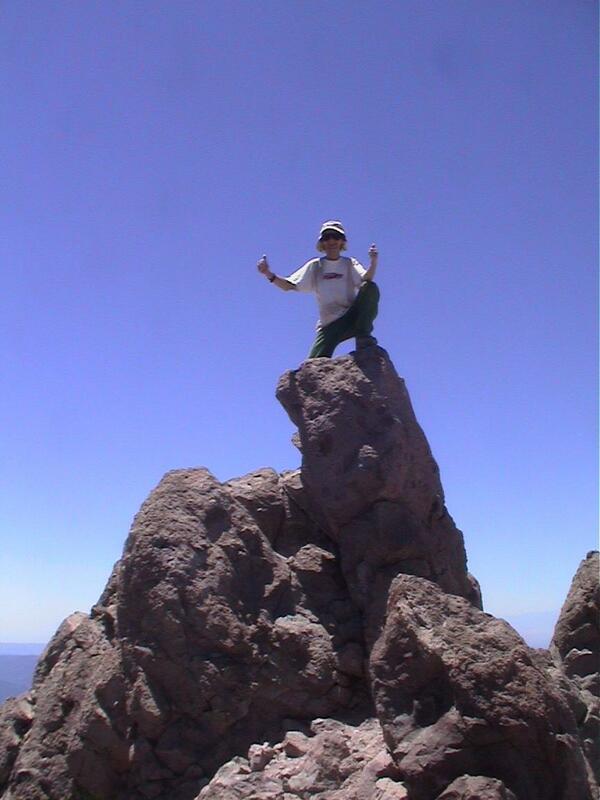 Here is a summit photograph of myself atop the western pinnacle. After attaining the highest point (whichever it truly is) at about 1:10 PM, I spent a full 75 minutes accepting congratulations from the many strangers - and enjoyed my roast beef sandwich with hot Chinese mustard as if it were my last meal. The peanut butter chocolate truffles went great with a rice krispies bar of the same flavors and with my ubiquitous liter container filled with Equal-sweetened milk instead of tasteless water. I was successful in raising Edward Earl via somebody's borrowed cellular telephone. Edward, who himself had completed California but 17 days previously (with Scott Surgent and myself in attendance on Placer County's Granite Chief), was quite happy to share my wonderful news. I asked him to relay to my mother the news of my success since a second cell phone call is more expensive than simply using land lines over the normal telephone grid. Ascent had consumed roughly ninety minutes and the descent proved to last but an hour. Later in the afternoon I found myself at a cheap motel in Red Bluff. Evidently the weather forecasts had come true - temperatures for the northern Sacramento Valley were near or at record high levels. It was 109° F at 7 PM outside my room - and had been as high as 114° F earlier while I was on Lassen Pk. I celebrated by eating virtually all of my food and, rather than having my requisite pint of ice cream (after any 4,000+ foot day), held off in anticipation of wallowing in the stuff on my 42nd birthday but three days later. What a birthday gift - my very own California state completion!